Found 12 blog entries for December 2016. Thursday, December 29th, 2016 at 10:07am. Well here we are on the doorsteps of 2017. The past year certainly flew by and was full of surprises and included one of the busiest housing markets we’ve ever seen. Here are several well researched and thought out predictions for the housing market going into 2017, and sprinkled throughout are also a few more “Humorous” predictions that span from Fake News Stories, The Seahawks and even to Marvel Entertainment… We hope you enjoy! Friday, December 23rd, 2016 at 10:55am. From zoo sparkle to gaudy neighborhood displays, where to trip the holiday lights fantastic! There's nothing like a stunning display of Christmas and holiday lights to evoke childhood memories. Treat your family to some glowing, electric, "ooh-ahh" joy this season by visiting one of the many spectacular displays lighting up zoos, gardens and neighborhoods. 2016 Sammamish Market Report/ 2017 Housing Predictions... One Word: HOT! Thursday, December 22nd, 2016 at 11:08am. Thursday, December 15th, 2016 at 1:39pm. The Fed hiked its key rate by 25 basis points to a range between 0.50% and 0.75% at Wednesday's meeting. That increase is likely to have an effect on mortgage rates going forward. To that end, The Cascade Team has calculated how the rate hike this week would affect mortgage payments with rates moving up from a 4.0% rate to one with a 4.25% rate. (Please note that the payments are based on borrowers with a minimum 720 credit score and 20% down. Payments also do not include property taxes or any HOA fees or assessments). One rate hike won't change the world but the process of rising rates affects millions of Americans. If you have a credit card or savings account, invest in stocks or bonds, want to buy a home or a car, pay attention. Wednesday, December 14th, 2016 at 9:42am. The Cascade Team is very happy to announce the addition of two new offices. Located in Avondale just off the I-10, our Avondale office team is committed to delivering Simply Outrageous Service to our clients by providing more technology and service than any other local Avondale Realtors, all the while provide unparalleled value. If you have a West Valley home to sell, or are looking to purchase, contact one of our local area real estate agents below. The Second office is located in Vancouver, WA and will be managed by Gary Firth. 2017 is Almost Here: Elevate your Real Estate Career… More Money, Listings & Sales! Tuesday, December 13th, 2016 at 9:38am. What are your thoughts on ‘Transparent Bidding’ in real estate? Monday, December 12th, 2016 at 10:42am. I would be very interested in hearing comments of this topic. 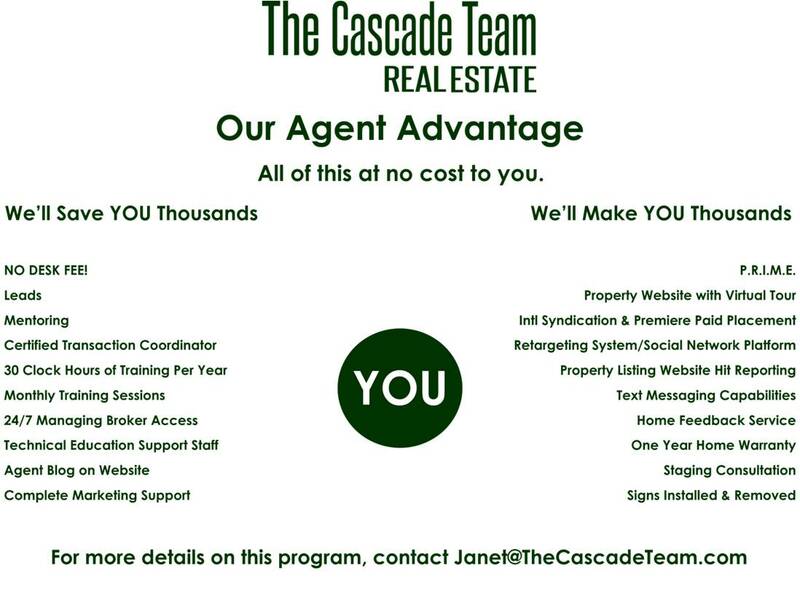 At The Cascade Team we already have a "Make An Offer" button on all of our in-house listings, so this is something we could fairly easily modify and do.... But there are definitely some negatives to go along with possible advantages. As an Agent/Broker I would love to hear from you, and also as a home Seller/Buyer I would love to get your thoughts! Brokerages and tech firms are experimenting with "transparent bidding," which shows buyers all the offers made on a listing. Friday, December 9th, 2016 at 11:35am. Housing Inventory Plunges To Lowest Level Of Year, As Housing Sales Hit Busiest November Period Of All Time! Tuesday, December 6th, 2016 at 12:35pm. The Seattle residential real estate market is not taking time off for an end-of-year breather! November showed a 13.2 percent drop in inventory of single family homes. November also showed a 31.3 percent spike in closed home sales. And an 11 percent increase in prices compared to the same month a year ago.